Inlays and onlays are dental restorations that are more extensive than dental fillings but less so than caps and crowns. They are typically formed in a dental lab and are made of gold, porcelain or resin depending on the patient’s needs and aesthetic goals. An inlay refers to a restoration that is formed to fit the center of a tooth, whereas an onlay refers to a restoration that encompasses at least, one cusp of the tooth. Both inlays and onlays are bonded to the surface of damaged teeth and matched to the color of the surrounding teeth. that inlays and onlays can serve as alternative treatments to dental crowns when you have a broken or damaged tooth? When fillings are not enough to adequately repair a tooth, an inlay or onlay can be custom-created to fit securely onto the tooth’s surface. 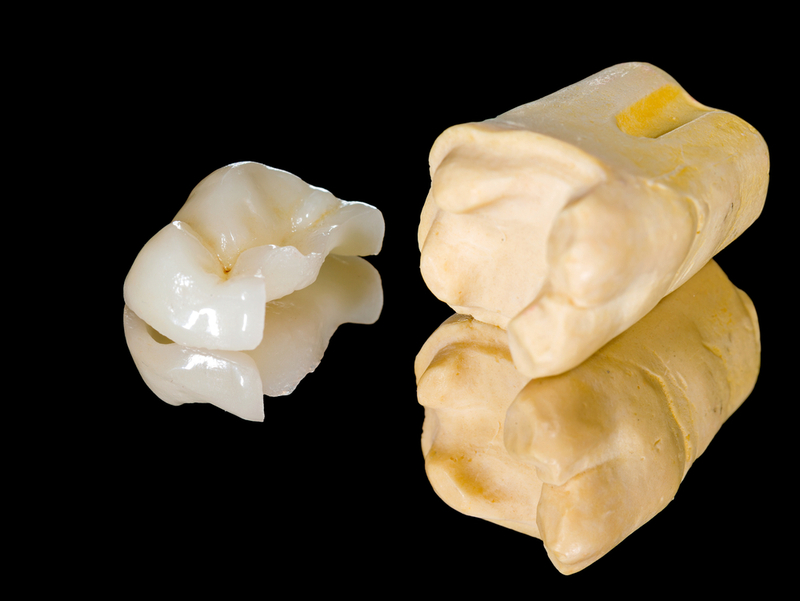 Depending on the materials used, the restoration can be created to appear natural and will have the same function of an organic tooth. Inlays and onlays have extremely high success rates and because they are custom made for each patient, most last longer than traditional fillings. Am I a candidate for an inlay or onlay? You could be a candidate for an inlay or onlay in if you have moderate tooth damage or decay and are in search of an alternative restoration option to a crown or cap. Schedule a dental consultation for a complete examination and to find out if an inlay or onlay is right for you. What should I expect when I get my inlay or onlay restoration? Your inlay or onlay restoration will be completed over multiple dental treatments. First, your tooth will be prepared for treatment, and an impression will be taken to serve as a mold for your new restoration. You may be fitted with a temporary restoration while your permanent inlay or onlay is fabricated. Once completed, you will return to have the temporary restoration removed and the permanent one bonded to the surface of the teeth. Special care needs to be given to your teeth while temporary restorations are in place. It is important to avoid sticky or hard foods that could cause significant damage to temporaries. Once you receive your permanent inlay or onlay, you can resume normal eating, brushing and flossing habits.